Women played a very important role in the life of the Native American. Women played a very important role in the life of the Native American. They were more than just mothers of the tribes’ children. They were builders, warriors, farmers, and craftswomen. Their strength was essential to the survival of the tribes. In most cases, the women were actually in charge of gathering materials and then building the homes for everyone. They maintained their homes’ roof, and created new houses for tribes to live in. This is an astonishing achievement, particularly for the women of their time. The men knew that women were the source of life, and provided a feeling of strength and consistency to their lives. The women in Native American tribes often helped their men to hunt down buffalo. Then, when the buffalo were harvested, the women were responsible for skinning, cutting, and cooking the animal. They also gathered firewood, cooked, and repaired clothing and shoes. But Native American women were not simply homemakers. In fact, they served a great deal of important purposes and were essential to the tribe in other ways as well. Women made tools and weapons out of animal bone, which were absolutely necessary for everyone’s’ survival. 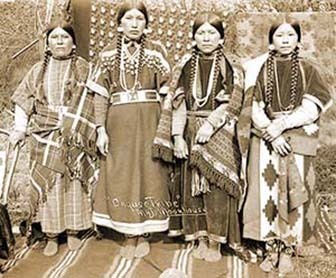 Not only was there medicine men in the tribes but there were medicine women as well. In fact, many Native American tribes believed that the women had more healing power and were able to soothe ill souls with their chants and connection to the spirit world. Medicine women gathered herbs to create healing medicines for those who fell sick within the tribe. Additionally, most Native American women were master craftsman who made beautiful blankets, baskets, and pottery. Jewelry was another favorite. There was a feeling of mutual respect between the men and women of the tribes. They cared for their children and husbands, just like the modern woman does today. Without their help, it would have been very difficult for the Native Americans to survive.